I was limiting myself to characters included in this list: Characters Created by Stan Lee . Furthermore, I wanted to put together a team that would be using at least some of his more prominent creations such as Spider-Man or the Hulk. For example, Lee created the Marvel versions of the Warriors Three but I rejected going with them as my main win condition because they are well down the list of ‘characters you associate with Stan Lee’. I also wanted a Fantastic Four character which pretty much means Mr. Fantastic or Human Torch (there are cards for The Thing, but the next time I see somebody include one on a team will be the first). I decided to go with Human Torch: “Flame On!” for the burn damage. I included Black Widow – Stinger as my final character mostly because she’s a good cheap character. (because the latter comes with the former). This team was about the Surtur with Breath Weapon. It was actually supposed to be a Warriors Three team, but the player had brought the versions of Fandral, Hogun and Volstagg with the Immortal keyword, instead of the ones that had the Deadly, Intimidate and Overcrush keywords (and possibly more importantly, buffed each other). He had trouble landing Surtur on a character face, only managing it once all game. I bought nothing but Dum Dums and Black Widows. I tagged him with slightly buffed Dum Dums on a couple of occasions. He hit me with a Surtur Breath Weapon attack which I survived even though it did me a great deal of damage. Doing that damage left him with a weak field. Between Breath Weapon and blocking I’d lost my entire field, but I had a huge whack of dice in my Prep Area. I wound up with something like 3 Dum Dums, 2 Black Widows, a couple of Sidekicks and just enough energy to pay fielding costs for the characters that had them. He did not have anywhere near enough left to block all that. Jourdo may be surprised to read this is the only game where I bought Human Torch. I decided to go with a burn damage approach this game, so besides Human Torch my other purchases were mainly Black Widows. 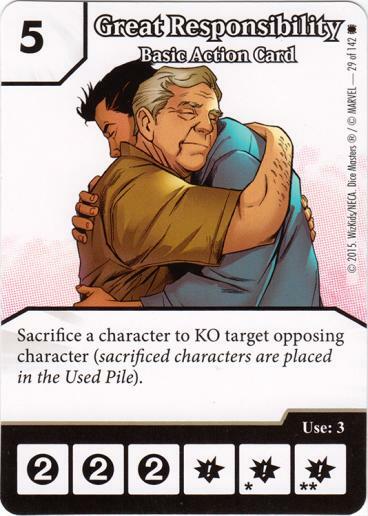 Field Human Torch, Field Sidekicks and Widows for burn damage. Attack with Widow whenever possible – either he lets her through, KOs her and takes Aftershock damage, or loses a chump blocker (which may limit him to the first two options next turn). If he attacks, block in such a way as to get as many Widows KOed as possible. Since, as Jourdo mentioned in his article, I managed to keep re-rolling Human Torch despite his efforts to remove it, I inflicted enough burn damage to put him in a hole from which he wasn’t able to recover. This was an Avengers team, centred around Nick Fury: Life Model Decoy from AoU, who can’t be blocked when his owner has 3 active Avengers (and that Nick Fury is himself Avengers affiliated). He had Ant-Man for the stats flip global, and the Venom that made his opponents pay 1 to field Sidekicks. This was the one game on the night where I followed the original script and bought Spider-Man. I bought a couple of Dum Dums early. I fielded a couple of Sidekicks early. He got his Venom out fairly early, on level 3. I attacked with any Dum Dum that got up to 5 A, to punch out his Sidekicks and other chump blockers to keep his field thin. 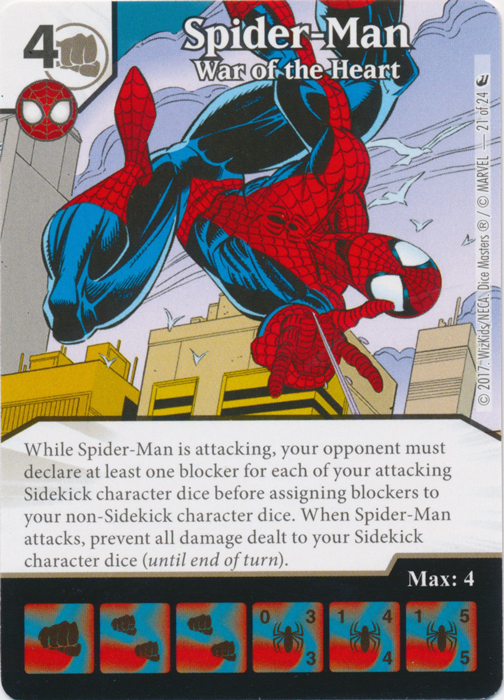 Everything lined up on the turn where I first drew my Spider-Man die. It came out level 1, which has a 0 fielding cost. 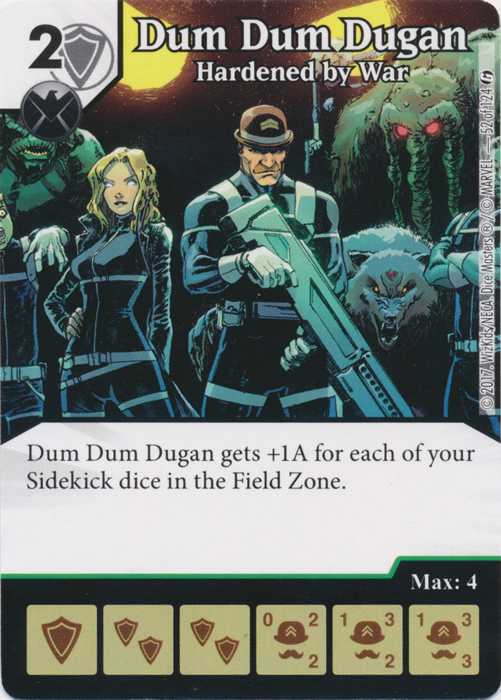 That allowed me to spend my energy to field a couple of Dum Dums (making 3 total in the field) and a Sidekick (I had to pay fielding cost for it because my opponent had Venom out). This was a fun team. You can go Human Torch/Black Widow burn or Spider-Man/Dum Dugan aggro and have a good chance to be successful either way. But it’s a long way from actually being a serious competitive team. I had four 6 (or more) costs on the team and no ramp. In Games 2 and 3 I bought one 4 cost character die each game, and in Game 1 I never bought anything more expensive than a 2-cost. The BACs were on the team for their names alone. It was a fun team and a fun night. 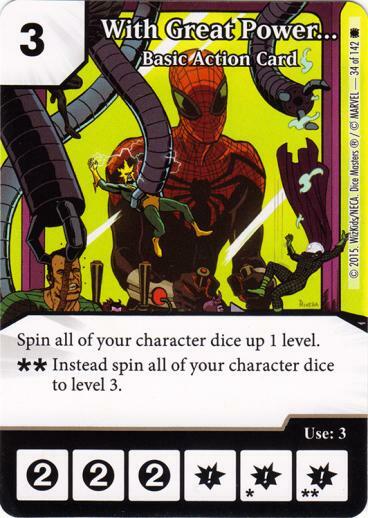 And while I did and do like the Dum Dum Dugan/Spider-Man interaction, I’d need to revisit every other card on the team before I began to think about taking it to an actual serious event.